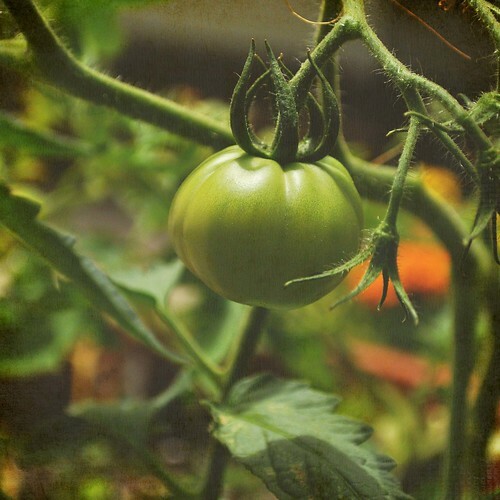 first tomato, originally uploaded by McGillicutty1. I haven't grown my own tomatoes or anything much for that matter in a gazzillion and a half years. I don't know if we can count the cress that my Mum sent for the kids... and by the way I loved it on my egg sandwiches. YUM. So I am over the moon to see my little plants producing the first fruits of my labor (well my fannying around, really), it's like giving birth all over again without the drugs. I remembered to tickle the flowers with my fingertip although there are enough bees around here I don't think pollination would have been any problem at all. I have almost trained Syd to water my little plants every day when she gets home from school, there is that slight problem with the nozzle on the end of the hose in that it's almost impossible to adjust it from anything other than pressure washer mode. Those poor plants are a little weary from the tornadoes inflicted on them once (almost once) a day! They start out standing up eagerly awaiting a drink, looking all bright and pretty, and end up flattened and soaked and wondering wtf hit them... poor bastards they don't deserve to be in the care of my family, they ain't done no wrong mister. So... here it is... my first baby in about ahem... what... squirm.. twenty seven years??? I have to say it's like riding a bike, although now that my sense of fear is good and established I couldn't help but fear nothing was going to become of all the love and tender tornadoes care that we have bestowed upon it. I wonder how long it takes for this little beauty to grow big enough and red enough to embellish a salad or tasty up ham sandwich. Oh Lord... all that care and then I'm gonna eat it!!! We (Judy actually) has our first tomatoes popping out now,too. Look forward to some BLT's and tomato sandwiches. Lovely green composition. I expect lovely red tomatoes about July 4th here in South Jersey. Nice details in this image! Thanks for sharing. How nice! I know we were excited to see our first tomato too! Nothing...and I mean nothing in this world can beat the taste of a home grown tomato!!! How exciting. Yum...there's nothing like fresh garden tomatoes. Such a pretty capture, too.